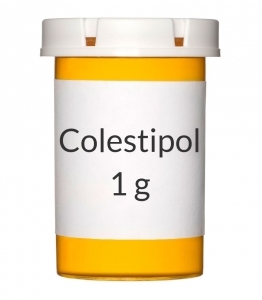 USES: Colestipol is used along with a proper diet to lower cholesterol in the blood. Lowering cholesterol helps decrease the risk for strokes and heart attacks. In addition to a proper diet (such as a low-cholesterol/low-fat diet), other lifestyle changes that may help this medication work better include exercising, losing weight if overweight, and stopping smoking. Consult your doctor for more details. This medication is known as a bile acid-binding resin. It works by removing bile acid from the body. In people with high cholesterol, this causes the liver to make more bile acid by using cholesterol in the blood. This helps to lower the cholesterol levels. HOW TO USE: Take this medication by mouth as directed by your doctor, usually 1 to 2 times a day. If your dose is more than 1 tablet, take the tablets one at a time. Do not try to swallow more than one tablet at once. Take each tablet with plenty of liquid (such as water, juice). Swallow each tablet whole. Do not crush, chew, or break the tablets. If you have difficulty swallowing the tablet whole, consult your doctor. The dosage is based on your medical condition and response to treatment. To reduce your risk of side effects, your doctor may direct you to start this medication at a low dose and gradually increase your dose. Follow your doctor's instructions carefully. It may take several weeks before you get the full benefit of this drug. Colestipol may decrease your absorption of other medications. Take your other medications at least 1 hour before or 4 to 6 hours after colestipol. Ask your doctor or pharmacist for more information or if you have any questions. Take this medication regularly in order to get the most benefit from it. To help you remember, take it at the same time(s) each day. It is important to continue taking this medication even if you feel well. Most people with high cholesterol do not feel sick. SIDE EFFECTS: Constipation, stomach/abdominal pain, gas, nausea, and vomiting may occur. If any of these effects persist or worsen, tell your doctor or pharmacist promptly. To prevent constipation, eat a diet adequate in fiber, drink plenty of water, and exercise. If you become constipated while using this drug, consult your pharmacist for help in selecting a stool softener and/or a laxative. Remember that your doctor has prescribed this medication because he or she has judged that the benefit to you is greater than the risk of side effects. Many people using this medication do not have serious side effects. Tell your doctor immediately if any of these rare but serious side effect occurs: difficulty swallowing, chest pain/pressure, severe stomach/abdominal pain, unusual bleeding/bruising, rapid breathing, confusion. A very serious allergic reaction to this drug is rare. However, seek immediate medical attention if you notice any symptoms of a serious allergic reaction, including: rash, itching/swelling (especially of the face/tongue/throat), severe dizziness, trouble breathing. This is not a complete list of possible side effects. If you notice other effects not listed above, contact your doctor or pharmacist. In the US - Call your doctor for medical advice about side effects. You may report side effects to FDA at 1-800-FDA-1088. In Canada - Call your doctor for medical advice about side effects. You may report side effects to Health Canada at 1-866-234-2345. PRECAUTIONS: Before taking colestipol, tell your doctor or pharmacist if you are allergic to it; or if you have any other allergies. This product may contain inactive ingredients, which can cause allergic reactions or other problems. Talk to your pharmacist for more details. Before using this medication, tell your doctor or pharmacist your medical history, especially of: swallowing problems, constipation, hemorrhoids, kidney disease. Because this drug can interfere with the absorption of certain nutrients (such as folic acid, fat-soluble vitamins including A, D, E, K), your doctor may direct you to take a multivitamin supplement. Consult your doctor for more information. Before having surgery, tell your doctor or dentist about all the products you use (including prescription drugs, nonprescription drugs, and herbal products). Older adults may be more sensitive to the side effects of this drug, especially constipation. During pregnancy, this medication should be used only when clearly needed. It may affect the absorption of certain nutrients. Discuss the risks and benefits with your doctor. This medication is unlikely to pass into breast milk. However, it may affect the absorption of certain nutrients. Consult your doctor before breast-feeding. DRUG INTERACTIONS: See also How to Use section. The effects of some drugs can change if you take other drugs or herbal products at the same time. This can increase your risk for serious side effects or may cause your medications not to work correctly. These drug interactions are possible, but do not always occur. Your doctor or pharmacist can often prevent or manage interactions by changing how you use your medications or by close monitoring. To help your doctor and pharmacist give you the best care, be sure to tell your doctor and pharmacist about all the products you use (including prescription drugs, nonprescription drugs, and herbal products) before starting treatment with this product. While using this product, do not start, stop, or change the dosage of any other medicines you are using without your doctor's approval. Some products that may interact with this drug include: "blood thinners" (such as warfarin). This document does not contain all possible drug interactions. Keep a list of all the products you use. Share this list with your doctor and pharmacist to lessen your risk for serious medication problems. OVERDOSE: If overdose is suspected, contact a poison control center or emergency room immediately. US residents can call the US National Poison Hotline at 1-800-222-1222. Canada residents can call a provincial poison control center. Symptoms of overdose may include: severe stomach/abdominal pain. NOTES: Do not share this medication with others. Laboratory and/or medical tests (such as blood cholesterol/triglyceride levels, vitamin levels) should be performed periodically to monitor your progress or check for side effects. Consult your doctor for more details.